The UCLA Executive MBA program at Anderson School of Management is a 22-month program with classes held every other weekend (Friday, Saturday, and the first Sunday of every quarter) on campus. There are three residentials during the program: an opening residential in September, a one-week elective blocks in August, and a field study residential in January of the second year. An international elective is also required. Alongside required courses, the UCLA Executive MBA consists of 12 units of electives which can be taken in a hybrid structure (half online and half on campus) or as an Elective Block during the summer. The leadership development portfolio of activities in the UCLA Executive MBA program is designed to develop emotionally intelligent leaders and focuses on key emotional intelligence competencies. Leadership Foundations is a required course that examines leadership development from individual, team and organizational perspectives. In the first year, Leadership Foundations starts with the Opening Residential and continues into the fall quarter and concludes at the end of the first year. Second year Leadership Foundations continues in the winter quarter and ends just prior to the International Residential. The Elective Block is a unique component of the EMBA program. It consists of five to six elective courses offered in five consecutive days August. Each course offered in the elective block is two units. Students have the option of taking one to two courses during the elective block. The SMR Program matches companies and organizations around the world with five to six Executive MBA students in their final year of study. The EMBA team represents a cross-section of business functions and specialties, such as marketing, finance, technology, and operations. The UCLA Anderson Executive MBA Class of 2018 features 73 students. About 32 percent of students in the class identify as female, with 68 percent identifying as male. Roughly 48 percent of the class is internationally-born. The average age of students in the program is 38, with ages ranging from 30 to 53-years old. Students in the program have an average of 14 years of professional work experience and 10 years of management experience. More than half of the class has held senior-level positions and about 15 person have worked in c-suite level positions. About 40 percent hold advanced degrees and 16 percent come from military backgrounds. Students have access to career advisors and executives-in-residence who will help with: Industry and job function overview, career assessment and development, targeting outreach and informational interviews, using the alumni network and other UCLA Anderson resources, resume and cover letter review, mock interviews, job offer evaluation and negotiations. Throughout the year, workshops and panels occur, and feature Parker CMC advisors, second-year students, alumni and executives. Anderson also provides extensive web-based career resources for students. During the first quarter, students prepare for recruiting season with the Career Series course, taught by Emily Taylor, associate director of MBA Career Education and Parker CMC advisors with the help of the second-year teaching assistants. Hundreds of companies seek out Anderson MBAs by visiting campus, posting jobs and searching through resumes. Anderson helps students expand their network and grow relationships with these companies, as well as with companies that may not have a large presence on campus. 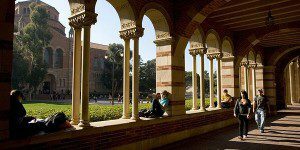 The cost of the UCLA Executive MBA program is $77,947 for the first year, totaling around $150,000 for the entirety of the program. Executive MBA fees cover registration, tuition, books and software supplies, meals, parking, and off-campus residential costs. All costs for the International Seminar, except airfare, are included. Students are eligible to apply for low-cost federal and private student loans. Qualified students may receive up to $20,500 per year from the Federal Stafford Loan Program. Additional funds are available through private loan programs. Applicants to the Executive MBA program must have completed a Bachelor’s degree from a regionally accredited college or university and possess full-time, professional work experience, not including internship experience, for admission. To apply to UCLA Anderson’s MBA programs, applicants must also submit a completed application form, college transcripts from degree-granting and non-degree-granting institutions, a current résumé, and two letters of recommendation. The school also requires applicants to complete a personal statement. One optional essay may also be submitted to supply information on extenuating circumstances. Applicants must also send in their GMAT or GRE scores and a nonrefundable $200 application fee. At the end of the application process, students may register for an optional on-campus interview.